"I was always a guy who liked to climb my projects fast, light and without too much effort," Austrian climber Hansjorg Auer says of his August 26 free solo climb of Mephisto (5.11+, 985', FFA: Rieser-Schiestl, 1979) in the Italian Dolomites. "Checking everything over many days takes out a lot from the bold style [of] a solo in general is." 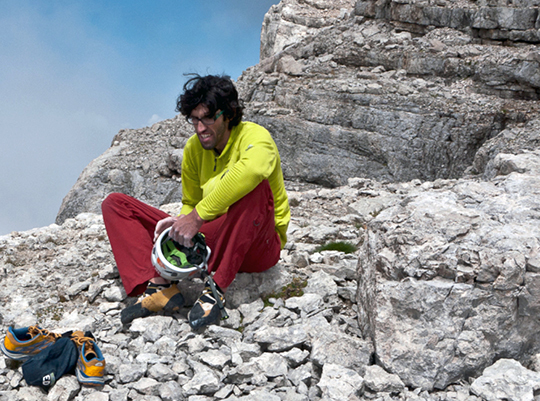 Auer performed the solo after climbing the route, on August 23, only once with a partner. "Upon reaching the belay [above the crux] pitch, I looked back down at the holds and dishes breaking up the compact limestone wall and immediately accepted that this route would be the one," he writes on his blog. For his solo, Auer accessed the steep limestone route, which starts on a ledge midway up the West Face of Sass dla Crusc (2907m), by climbing the Mayerl Corner. Some of the holds on Mayerl Corner are loose but climbed often, making terrain more predictable, he says. From the ledge Mephisto cuts left, following grey, compact stone. The crux move on [Mephisto] has only a single undercling hold. Auer started up the route solo at 11 a.m., after the sun had burned off the morning fog. Alpinist caught up with Auer over email while he was waiting to catch his flight to Kenya to work on a documentary with Reinhold Messner about a 1970-climbing rescue on Mt. Kenya (17,057'). He plans to use this trip to acclimate for an expedition to Nepal this autumn. Alpinist: Is there any crossover between preparing for dangerous big wall free climbing, such as climbing the Hallucinogen Wall (5.10 A3+, 16 pitches, Becker-Lella-Newberry-Webster, 1980; FFA: 5.13+ R, Auer, 2011) without pre inspection and hard, long free solo climbs? Hansjorg Auer: I like to climb my projects fast, light and without too much effort. So alpine climbing, mountaineering and also sport climbing is all about that for me. And, honestly, free solo climbing is the discipline which is the nearest to that vision. Checking everything over many days takes out a lot from the bold style [of] a solo. And I guess that's the reason it's so intense! Alpinist: Instead of rehearsing a route for days or weeks with a rope before your solos, it looks like you memorize the crux moves and then climb the terrain solo. HA: Exactly that's the point. If I would have to invest more days it takes out the fascination for me. I'm really good on memorizing rock features. My girlfriend had trouble following the crux pitch on Mephisto. She needed time [to work out the moves], which [gave] me [time to look at the holds]. I got this perfect feeling [of] joy and imagination to climb [the] face solo. Alpinist: You've climbed some very long, hard routes ropeless including the Via Attraverso il Pesce (The Fish Route: 7b+/5.12c, 37 pitches, 850m). In your blog you write that you stopped soloing. Why did you stop free soloing? Why did you restart? And how does The Fish Route climb compare to Mephisto? HA: Why I stopped solo climbing in the last four years, the route Bayrischer Traum in November 2011 was the last big one, because the right moment simply didn't arrive. I knew that I could still do it and wanted to do it, but I never felt the perfect time or the perfect project. After Siberia, I felt that something changed and I got focused about free solo. I simply needed to find the right route and someone [to climb] it with me at least once. The Fish Route is longer and technically harder with more exciting pitches from [a] solo perspective. 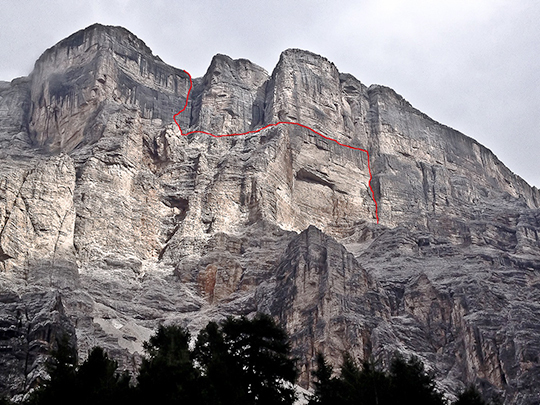 Mephisto is only one crux pitch [with] straightforward climbing similar to sequences on the Fish Route. Alpinist: Describe Mephisto's crux pitch. HA: [It] has three sections and is about 30 meters long. First a balancy start up a slab to a good jug, then a powerful undercling move and a delicate finish up the face to gain a horizontal crack, which leads out right to the belay. Alpinist: Can you tell us more about what you felt once you reached the top? I was happy because I was waiting for a moment like that [for] such a long time. I feel lucky that I still see free solo climbing as a personal thing. I played the game honestly, only doing it when everything was perfect. And that's what I would wish people to see it—as a discipline in climbing where the protagonists take a lot of risk but are not playing Russian roulette.